Water was the main theme of the On Aura Tout Vu Couture Autumn/Winter 2014-2015 Show, titled « H2O ». Another water-influenced collection : Dion Lee Resort 2014 (water was the main inspiration of this presentation). 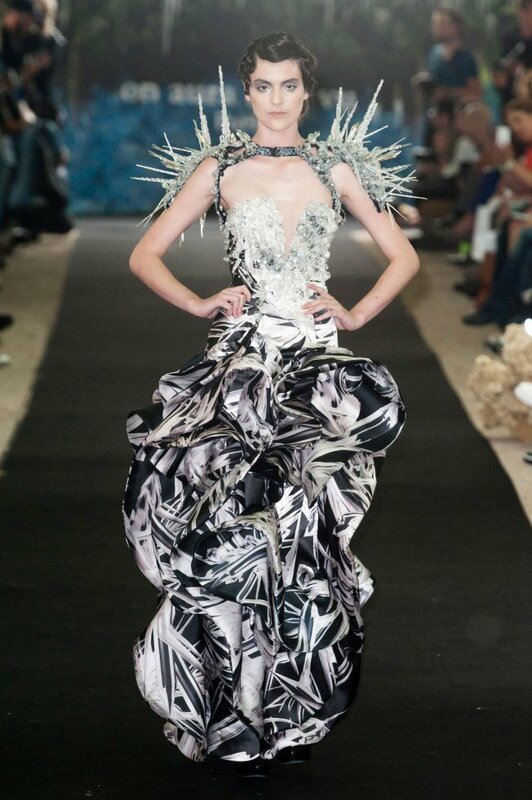 Zizi Jeanmaire’s « Mon truc en plumes » (« My feather thing ») was one of the references of Jean Paul Gaultier’s « Black Swan »-themed Couture Autumn/Winter 2011-2012 show, which highlighted, for the finale, the « Libertine Swan » ostrich feather wedding gown, worn by Mylène Farmer. Other Zizi Jeanmaire-inspired collections : Catherine Malandrino Autumn/Winter 2007-2008 (the short black side-parted hairstyle of this show was an homage to Zizi Jeanmaire), Dior by John Galliano Couture Autumn/Winter 2005-2006 (the French ballet dancer / singer was one of the influences of this collection). To read about Mylène Farmer-inspired collections or Mylène Farmer’s collaborations, search for the « Mylène Farmer » post that I have published on October 2, 2012. 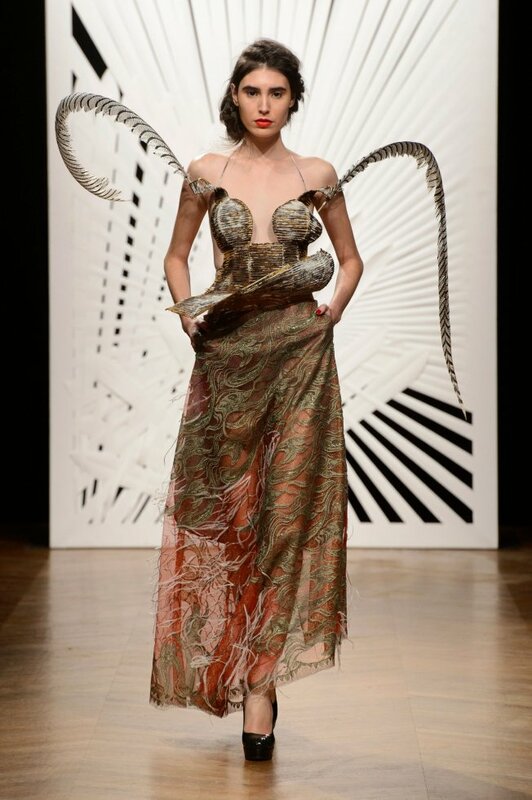 The Antonio Ortega Couture Autumn/Winter 2014-2015 Show, titled « Snake, Myth and Reality / Serpent, Mythe et Réalité », paid tribute to Quetzalcoatl, the Feathered Serpent. 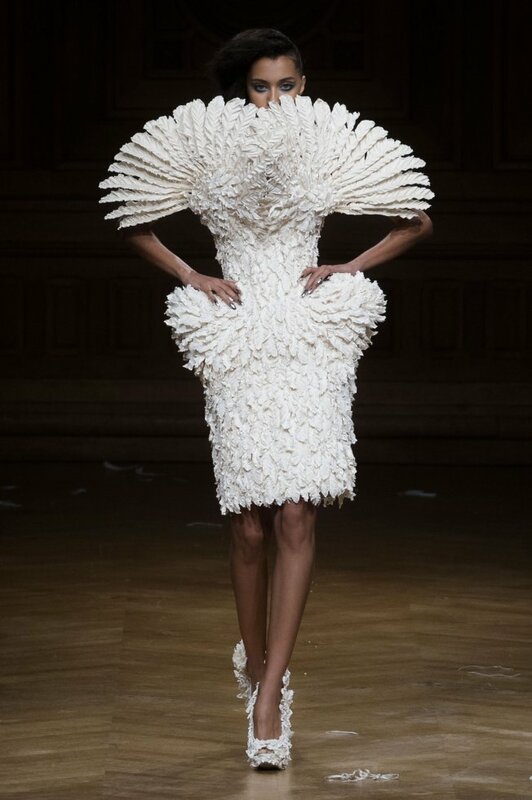 One dress in the Maison Anoufa Couture Autumn/Winter 2014-2015 Show paid homage to the Eiffel Tower. Other Eiffel Tower-inspired items : Jean Paul Gaultier (the couturier has often paid tribute to the Eiffel Tower, especially in his Couture Autumn/Winter 2000-2001 Show, titled « Paris and its muses / Paris et ses égéries », and in the Jean Paul Gaultier X Pataugas Autumn/Winter 2010-2011 capsule collection), Kenzo by Humberto Leon and Carol Lim Resort 2015 (« Eiffel Tower » motifs on the brass buttons of pea coats), Louis Vuitton by Julie de Libran Resort 2012 (« Eiffel Tower » pattern), Moschino Cheap and Chic Autumn/Winter 2011-2012 (look 13 : « Eiffel Tower » print on a dress), Pierrot Autumn/Winter 2004-2005 (« Eiffel Tower » intarsias on sweaters). 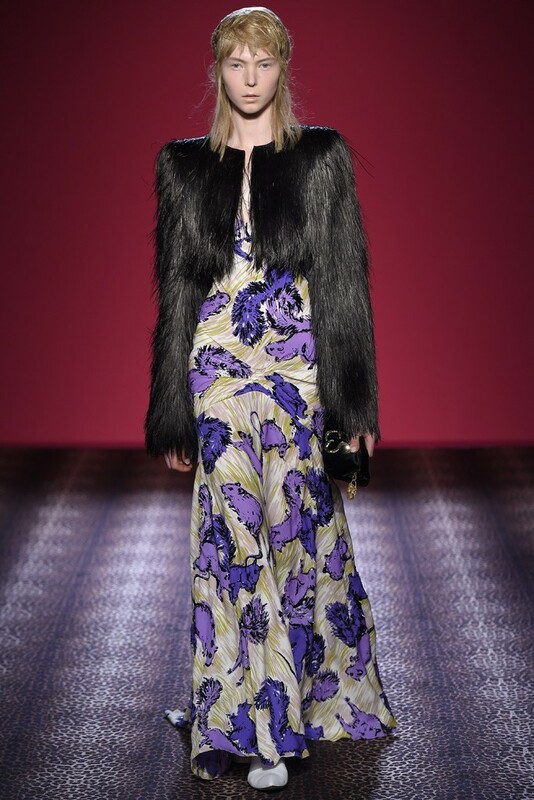 The Ulyana Sergeenko Couture Autumn/Winter 2014-2015 Show, which featured an homage to Tamara de Lempicka’s « The Swans » painting in the scenography, made reference to Ukraine’s past, at the beginning of the 20st century, and Ukraine’s current political conflicts. Other Ukraine–inspired collections : Gareth Pugh Autumn/Winter 2013-2014 (this collection was influenced by Ukraine’s warrior women of the Asgarda tribe), Jean Paul Gaultier Couture Autumn/Winter 2005-2006 (this show paid tribute to agrarian Ukraine), John Galliano Autumn/Winter 2009-2010 (partly), Prabal Gurung Autumn/Winter 2013-2014 (Ukraine’s Asgarda tribe inspired the powerful pieces of this collection). To read about other Tamara de Lempicka-influenced collections, search for the « Tamara de Lempicka » post that I have published on March 23, 2014.